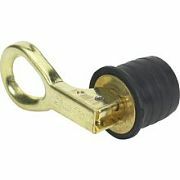 Boatersland Marine > Plumbing/Ventilation > Pipe/Hose Adapters > Moeller 02900010 Snap-Tite Bailer Plug - Brass 1"
Moeller 02900010 Snap-Tite Bailer Plug - Brass 1"
For mounting only from inside transom. Fast-working, camaction plug adjust to provide tightest possible seal. Will not jar loose under vibration. Corrosion-resistant construction and designed for use with Moeller drain tubes. Comes with neoprene seal. Fits: 1"